Our newest bespoke retirement village Charters Village, in East Grinstead, West Sussex, is a double award winner – collecting two national housebuilding titles in the space of a month. The village was named Best Retirement Scheme in the UK in the Housebuilder Awards and a fortnight later collected a Silver accolade at the prestigious WhatHouse? awards, recognised as the Oscars of the housebuilding industry. 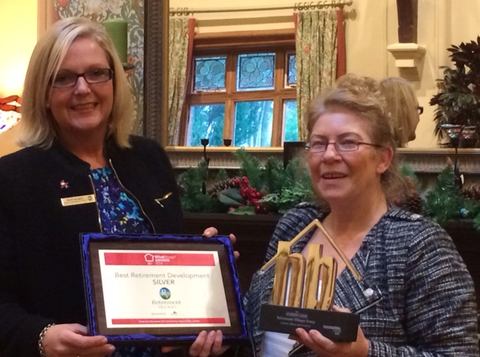 “It is always pleasing to win awards that are selected by peers and experts from within the housebuilding sector and also for a village which is not yet complete,” said a delighted Sarah Burgess, sales and marketing director, pictured (left) delivering the awards to the village to facilities manager Anthea Call. Phase Two of build gets underway next and will provide more retirement apartments and cottages to add to the village life already established at this East Grinstead location. The village includes beautiful Charters Towers, the fully refurbished Arts and Crafts clubhouse building, at the centre of village life. There is also a brand new registered care home within the grounds.